Product #1878 | SKU NIK2195 | 0.0 (no ratings yet) Thanks for your rating! A fast, high-performance mid-telephoto 85 mm fixed focal length lens with a maximum aperture of f/1.4 that offers superior image quality. Adoption of a maximum aperture of f/1.4 and rounded diaphragm (9 blades) enables the expression of bright and beautiful blur characteristics. The lens exhibits excellent rendering capability with shooting all distances, from close-up to infinity, making it especially suited to portrait photography. It is also an excellent choice for shooting in relatively dark situations, such as indoors or for capturing night landscapes. 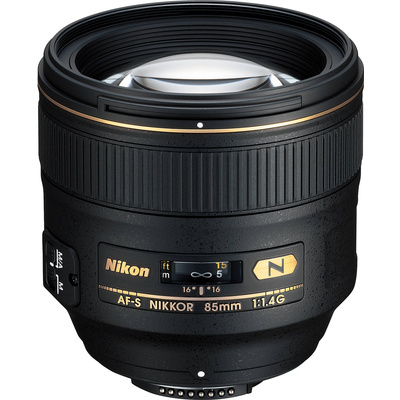 A new optical design that makes the most of the performance expected of the latest fast fixed focal length Nikon lens. Nano Crystal Coat adopted to significantly reduce ghost and flare. Equipped with a Silent Wave Motor (SWM) for extremely quiet autofocusing. Equipped with two focus modes, M/A and M, as well as a new and improved manual focus drive mechanism. The lens offers two focus modes, M/A (autofocus with manual override) and M (manual). In addition, the new and improved manual focus drive mechanism reduces manual focus time lag for improved manual focus operation in M/A mode. Nikon’s internal focusing (IF) system has been adopted with no increase in the length of the lens.